The setting for this highly instructional video is the Selway Wilderness of Idaho ("the Amazon of the North"). 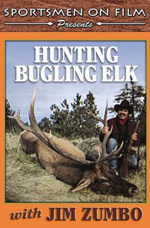 Hunting both on his own and with outfitter Ken Smith, Jim succeeds in taking an old 6X6 bull on-camera in mid-bugle. A Sportsmen on Film DVD production. The setting for this highly instructional video is the Selway Wilderness of Idaho ("the Amazon of the North"). Hunting both on his own and with outfitter Ken Smith, Jim succeeds in taking an old 6X6 bull on-camera in mid-bugle. But the actual trigger squeeze is only a small part of the total experience. Join Jim as he: Flies into the Selway. Packs in 17 miles to base camp on horseback. Shows you his equipment, clothes, rifle and a wide variety of elk calls. Describes and shows you how to act and react to lone bulls or herd bulls in a variety of circumstances.